Here is my happy face!! We had a very early harvest this year as the weather had been so good and dry. Unfortunately it didn't last throughout the whole harvest but we got through it quickly and problem free. This is my favourite time of year when I get to be out on the combine for most of the day. I can look for bunnies, hare, deer etc. I have also made a full recovery from my last post and don't have any lasting effects from my injury. I suffered a work related injury last week. Whilst going about doing my jobs on the farm (chasing a mouse), I managed to cut my leg on something. 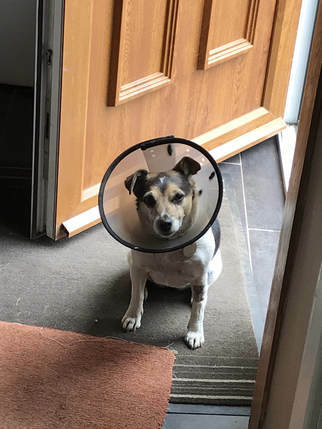 A quick trip to the vet and 3 staples later, I was soon back to my usual self (although not very impressed with the 'lampshade' the vet said i was to wear for 10 - 14 days). I was back to the vet yesterday to get my staples removed and got a check up, the vet says I am very fit and have good teeth for my age (cheeky!!) so these mice better watch out!! We will be starting the harvest in the next week or so, so I had to make sure I was back up to full fitness for that, can't go letting the team down at this time of year. Now that the 'Beast from the East' is passed, i think Spring has finally sprung although from what i hear dad saying, the cold weather is not quite over yet! I like to play in the snow and try to catch snowballs but i had to be very careful in the heavy snow, some of the drifts were so deep that i almost disappeared, thats the problem with having short legs! I am not very happy in this picture, I am out in the cold without my jacket on, it was freezing. Hopefully we will get back to some farm work soon and I can spend my days in the tractor, thats my favourite. Between cutting logs, making up nets, a super busy Summer Sale and a very wet harvest (which dragged on for ages), I have not had any time to update my blog!! We are still busy, busy on the farm when the weather is good, which unfortunately, is not very often. All this work makes me tired but i manage to grab a wee 5 mins here and there, normally when dad and John go in to get something to eat. I have to stay beside theirs boots though as they are sometimes in such a hurry to get out again that they forget all about me, how dare they!! Can I just ask, what is going on with this weather, we have had colder days in July!! All this 'warm' weather does not stop the orders coming in. We have been busy, busy since the start of the year. Dad has also been keeping the log pile stocked up and John and Steph have been making up a constant supply of jumbo nets. ​Here I am doing some quality control earlier in the week. October has seen some beautiful weather with nice, crisp days but we have still been busy with log deliveries. 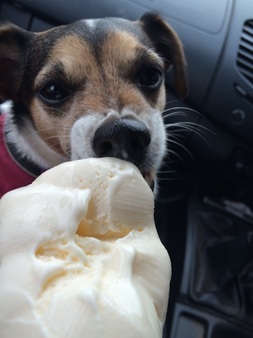 The best place to deliver is Milnathort (or the surrounding area) as dad stops and buys me an ice cream! My new favourite flavour is Strawberry. This was actually Steph's ice cream cone but since dad got a her double scoop, I thought half of it was for me!! It was a bit cold and frosty this morning so might be coming to the end of ice cream season unfortunately. With some late nights and early starts, we managed to get the harvest finished about 10 days ago, thank goodness. With all the rain we have had lately we would have been struggling to get any combining done now. ​We have moved onto seeding now, which can be a bit bumpy but i take my bed with me and can catch up on some sleep after all the late nights! Thankfully John is good at going in a straight line so I don't need to supervise! It has been all hands on deck with the harvest since I last spoke to you. As the weather has been fairly good we have had some busy days on the combine. 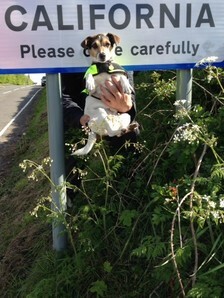 ​Last week I was out working with dad when he had a little accident. 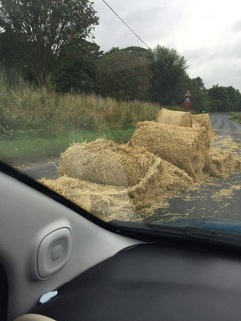 He then 'baled' out and left me to tidy up the mess!! ​It really was the last straw, I have now gone back to working with John!! We had a very busy June & July trying to keep up with the demand from the Summer Sale but I'm pleased to say, with my help, we managed!! Now its on to a very busy time for us on the farm, my favourite (as you can see from my picture), harvest time. Can we all wish for some good weather so we can get the combine out and make the harvest an easy one. Gotcha!! Just joking really. But my goodness, with all that sunshine this week, it felt like we were driving in the 'real' California not the Scottish one. Of course, me being me, I couldn't resist the opportunity to take a selfie! Been hectic as anything lately with a very busy start to the Summer Sale and our farmwork beginning in earnest too. In case you haven't heard, our Spectacular Summer Sale started on Monday and don't I know it! My job as 'Quality Manager' is to check that all the stock going out meets our usual first class standard and it's taken me days to thoroughly check through this lot. Now all I have to do is remember where I left my bone .......?!! We've been stock-taking this week and as you can see here, I'm in charge. So far the numbers are stacking up - woodn't you know it. On the plus side, I found my old (previously lost) jacket and a big fat rabbit to chase around the farm for a whole day - yippee! We've had quite an exciting week one way and another. It was Dad's Birthday so we had a wee party which went on past everyone's bedtime. Even I was up in the night running around and this is a photo of the best bit - it's ME inspecting the cake. You see I take my responsibility for quality very seriously!! I kept a close eye on the results of the General Election as it appears a lot of 'Top People' are now out of work and looking for jobs. I've told the team they're NOT having my job. We're expecting to be busy this week - Alex Salmond was heard to say of his opponents he'll "hold their feet to the fire" - so just waiting to hear how many logs he'll need for that carry on!! I'm told it's May now although it feels like November outside, so we've still had log deliveries to do all week (see me here in the pick-up). Elsewhere in the news, I hear the Royal family has had a delivery of a different sort. Seems to be taking them a long time to think of a name though. I suggested Princess Mika, but Dad says there can only be one ....!! All the nice weather we've had recently means we're ahead with our farm work. But there's always something needing done around Bogside and this week, it's field drainage. Here I am in my hi-viz vest, out of the digger and giving the job very close attention. Note to self - must get this on my cv!! Sorry if my green eyes frighten you this week, but one minute I was checking the trees in the woodshed looking out for any mice (as you do), the next thing there's all hell on. And this is what it looks like when you've eaten rat poison. Still, the emergency dash to the vet sure livened up what would have been a boring old Tuesday evening and I'm pleased to say I wasn't off the road for long. Meanwhile, despite the near tropical temperatures this week, I've been out and about with the boys delivering logs as usual and helped to welcome some new customers on board. Or not ........ After studying the form, I picked two horses for The National, but it turned out both were 'donkeys'. One even fell at the first fence!! Other than that, I've been super busy with farm work this week, not to mention still delivering logs. Obviously! Been to Edinburgh this week on a delivery - my first time in the big city! me here (it took less than five minutes)! Hope you were as lucky - Happy Easter folks. Had a really busy week. We delivered logs to some new customers and work on the farm started up again. It was exciting to see the tractors back in action. I love watching hares and deers running about the fields!! But that's all very tiring, so as it was raining on Saturday, I decided to have a duvet day. 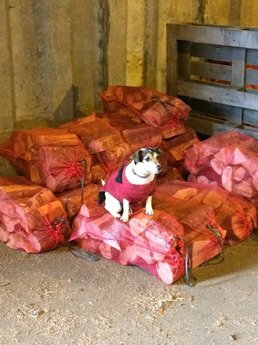 Mika The 'Log Dog' accompanies us wherever we deliver logs and she's extremely popular with our customers. She's also quite partial to biscuits (any variety)! Mika came to LogLine from a rescue centre and she's been an integral part of our journey so far.